Giancarlo hotel’s location is ideal: only 50 metres away from the beach, and one mile away from the centre of San Benedetto del Tronto. 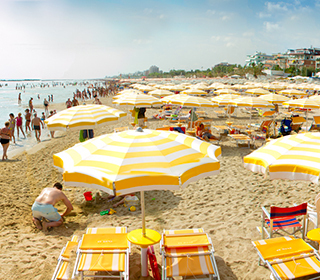 If you come to San Benedetto del Tronto, it means you are choosing a holiday surrounded by one of the most beautiful scenarios of the Adriatic: our sea, awarded for years with the “Blue Flag” certification, is crystal clear, with smoothly deepening shallow waters, ideal for children’s games; our fine sand beaches, our city, a famous seaside resort since the beginning of the 20th century, shows a fine urban architecture, with a long bike lane, many trees, especially palm trees, which won it the appellation of “Palm Trees Riviera”, and activities that can fulfill any tastes and budgets. And this is not all! Staying at Giancarlo Hotel also means discovering the territory. We organize day trips for our guests to wander around the hills of Marche region, or the little hamlets, among the most beautiful in Italy, well-known mountain areas, cities of art, like Ascoli Piceno, Fermo and Macerata, which can boast priceless art heritages. Some good advice? Do not hesitate to contact our staff during your holiday for assistance. Our territory offers a lot to discover, and we will be glad to provide you all the information and support you need to choose the best itinerary for you and your family.